It’s winter, and my skin is dry and itchy. I’m craving warmer weather and tropical smells…and softer skin. I decided to give myself a treat and whip up some sugar scrub to moisturize my skin. 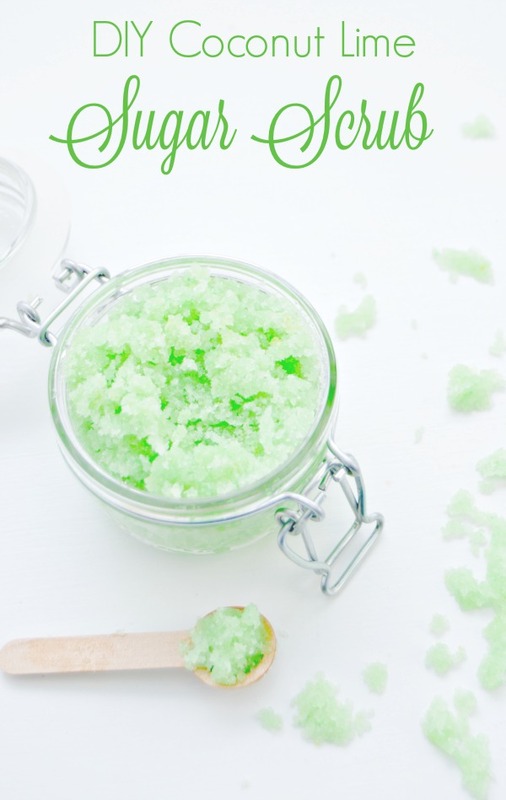 I wanted to make one that reminded me more of warmer times, and this Coconut Lime Moisturizing Sugar Scrub was just what I needed! If you are a long time reader here, then you may remember my Peppermint Sugar Scrub that I shared last year. It was so popular that it was pinned on Pinterest over 100,000 times! 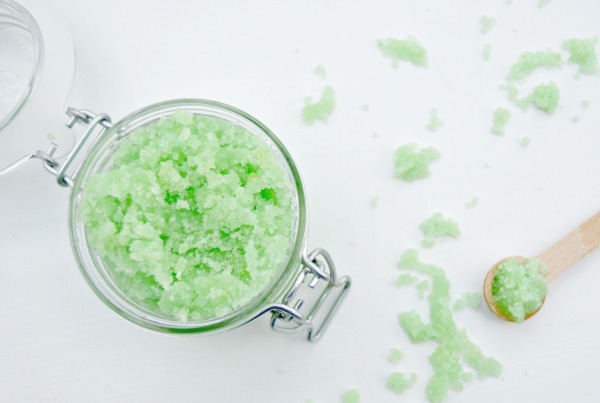 I hope that you love this Coconut Lime Sugar Scrub too. It’s not only a great at home spa treat that you can make for yourself and your family, but would also make a wonderful Valentine’s Day gift or just a sweet gift for a friend or loved one! 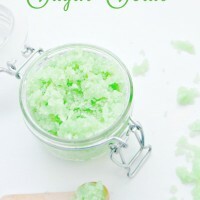 This Coconut Lime Moisturizing Sugar Scrub will leave your skin smooth and moisturized while smelling like the tropics! Mix together in a bowl and transfer to a lidded jar. Will keep for up to 6 months. I put a small container of it beside the sink in my bathroom to quickly moisturize my hands, and a larger container beside my shower/bathtub for the rest of my body…especially my feet, elbows and knees! All you have to do is wet your skin, rub a small amount of the sugar scrub into your skin, and rinse. The sugar helps exfoliate your skin while the coconut oil moisturizes and helps regenerate your skin cells. The lime essential oil acts as an antioxidant and can help reduce dark spots…it also is a great insect repellent! I hope you enjoy this sugar scrub recipe as much as I do! 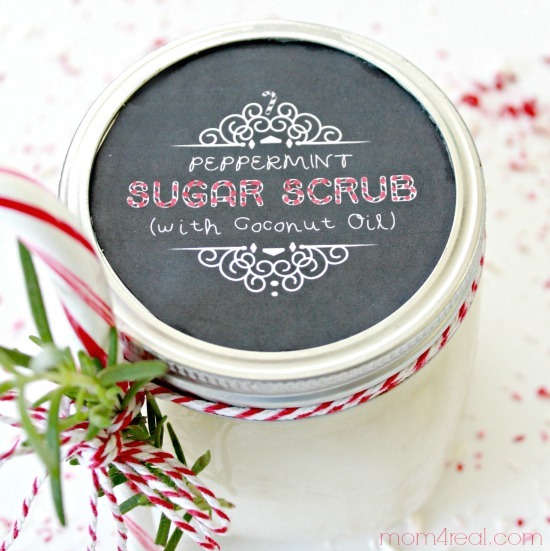 You can also check out my Peppermint Sugar Scrub Recipe HERE! I already wash my face with manuka honey and make a poultice of honey and cinnamon to draw out infection and blackheads. Your scrub sound perfect for someone like me who loves all things natural and is allergic to so many chemical products. This is a fantastic idea. Will try it tonight just before a steam. I think I’ll use vetiver just for the scent. Thank you!! I love the sound of your poultice…I’m totally going to try that! Hope you love your sugar scrub…I’ll have to make my next batch using Vetiver for sure! Have a beautiful day, Dinah! Where do you get your essential oils? Can you put some grated lime peel in for a little extra dash of color?? Or would that wreck the shelf life?? Your sugar scrub recipe sounds great and I look forward to trying it out. However, I do have one question/concern regarding the coconut oil. Since the scrub needs to be rinsed off in the shower, should I be concerned with the coconut oil coating and/or clogging my drain? I currently use coconut oil after my showers but never during in order to avoid that exact problem. I’m curious to hear if you have had anyone express worry over this issue. Thank You. So…I’ve never noticed if my lime EO is bright green. How did you get such a vibrant green color in your scrub? I thought about doing that but was afraid it would die my skin. Is this ever seen issue? I love making my own sugar scrub too! For a little more moisturizing add some glycerin to the mix!